Oisobagi is another type of kimchi that is loved by Koreans, especially during the hot summers. 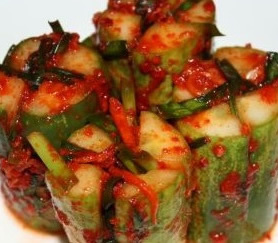 It’s also known as stuffed cucumber kimchi where cucumbers are specially prepared and formed into a pocket then stuffed with vegetables and spicy kimchi paste. It is usually served alongside a meal as a side dish and considered to be very healthy and delicious, supplementing a well-balanced, low-calorie meal. Keep in mind that kimchi can be made with cabbage, radishes and many other vegetables including cucumber and it always includes red chilies. It is the national dish of Korea, where no meal is served without at least one variation of this spicy, condiment-like salad. If you enjoy the taste of kimchi, you’ll be sure to like oisobagi as well. Thoroughly wash cucumbers and cut them into half width-wise. Take each half then make two slits lengthwise at 90-degree angles to each other, cutting from the raw end almost to the base but not all the way through. Boil water and add salt. Turn off heat and dunk cucumbers for approximately 45 minutes. This will help cucumbers stay crunchy. While cucumbers are being soaked, make stuffing by mixing garlic, ginger, green onion, gochugaru, and sugar in a bowl. Add 3 tbsp of water and mix all ingredients well. Rinse cucumbers with cold water and drain. Wipe and dry cucumbers. Gently place stuffing into each cucumber slits by hand and be careful not to cause complete splits. Evenly distribute stuffing to each cucumber. Refrigerated and store away cucumbers in a tight container for 1-2 days. Serve chilled while cucumbers are still crisp.